Floor displays are a great form of promotion! Create a custom display murals or retractable banners to take with you to your next event. Our popular Retractable banner stand with increased durability to withstand more frequent use. The strong base features a double foot and is made from heavy-duty aluminum for increased stability. A true time-tested classic design that accepts graphics or can be painted! Lightweight and tough plastic frame fills with ballast material for stability. To install graphics, secure to display with optional. Well Nuts Molded handle for transportation and hinges lock into place. Designed for temporary outdoor installations at retail locations and events. Hardware available in White, Yellow or Orange. Perfect for temporary outdoor applications such as churches, schools, events, real estate and retail locations! Simply drive the legs into the ground and slide your graphic into the frame! Hands down the strongest A-frame we carry! Made of black powder coated angle iron. Accepts rigid substrates such as aluminum and corrugated plastic. Perfect for temporary outdoor applications such as churches, schools, events, real estate and retail locations! For events, exhibits, and more, the flat mural display is an excellent way to advertise and promote your business or organization. Flexible springs ensure your message will move with the wind, not against it. Aluminum snap frame display with a steel spring base. The Spring loaded frame edges easily open and when closed, holds your vinyl graphics tightly. Perfect for outdoor applications such as schools, promotions and retail! Simplicity and ease coupled with a classic design. Simply adjust the height and hang your banners from the hooks for a striking appearance. Durable Steel Construction with Powder coated finish. Effective as a single-sided or double-sided display. Accepts grommeted banners with ease. Works exceptionally well in longer term applications such as retail, lobbies and interior corridors. Full-color graphics and portability make these versatile banners the perfect choice for checkout counters, tradeshows, retail shelving, or reception areas. Flexes in the wind on a spring mounted frame. Base fills with sand or water to anchor your display. Graphics printed on 10 oz.vinyl with weather resistant UV inks and protected by clear, non-glare, acrylic. Easy assembly! Sturdy, portable and effective. Holds your rigid substrate graphics straight and vertical! 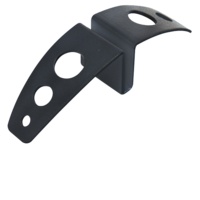 Heavy-duty black powder-coated steel construction. Holds rigid substrates up to 1" thick. Single or double-sided graphics are secured to holder with bolts. Designed for promotions, conferences and retail. Even the smallest messages can be professionally displayed! With over 7' of graphics, you are sure to grab attention of people walking by. Heavy duty spring mounted frame ensures your banner flexes in the wind. Wide footprint offers maximum stability. Double-sided banner easily attaches with pole pockets. Ground stakes and assembly tools included. Make a storefront statement with these portable sidewalk signs! This Double-Sided Simpo Sign II is great for outdoor use! It's weather resistant and maintenance free! It's easy to set up and put away and is portable. Fast and easy way to change graphics. Aluminum exterior professional presentation. "High-Performance" display with durable steel feet. Simply insert a rigid sign in the slot in the feet. Use indoor or as a temporary outdoor display. Straight Floor with 4-Sided Wrap Graphic Kit. Perfect for any event! This toolless, durable display is great for all of your events. Easy to manage and will last a long time! Make a "BIG" impact in a small space with our 3-sided Trilogy Tower Banner Display! Snap rails at the top and bottom for easy installation. Hinged connectors can be used to easily change the configurations. Adjustable height 2-piece telescoping flip level poles. Includes a reinforced soft case for protection. Turn heads with this uniquely shaped, four-sided indoor fabric display. Set up in seconds with fold-out base and push button pole. Ideal for trade shows and will compliment any POP display. Can be used with any of our Sail Sign bases. For Indoor use. A perfect choice for the infrequent exhibitor on a tight budget, the Echo pop-up is your first pick for price and value. Molded handle for easy transport. Weather resistant and maintenance free. Fill with sand for stability when outside. Holds two rigid 4 mil corrugated plastic panels. Graphics can be printed single or double-sided .Hardware available in black or white!